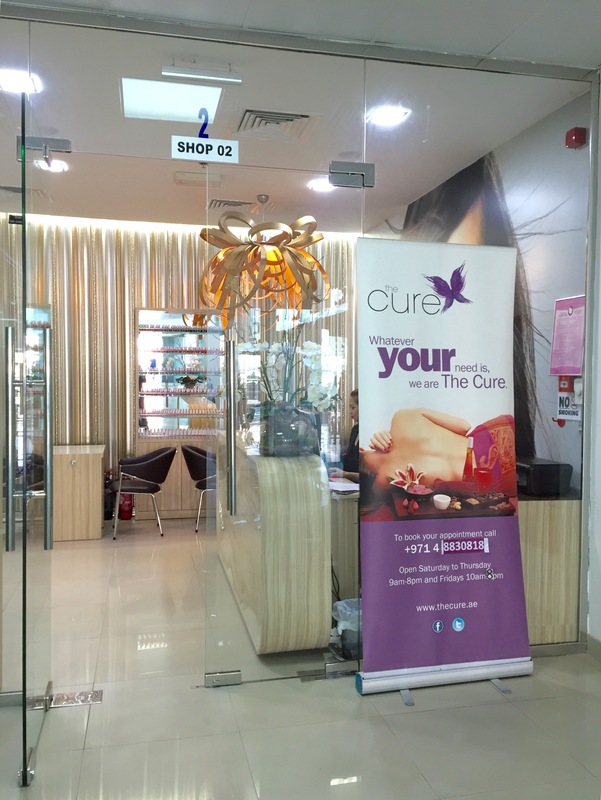 Late Monday afternoon I set off to The Cure Beauty Spa, located in the Investment Park in Green Community, Dubai. I had heard many good things about The Cure, especially their raved about facials, so when they invited me to check out their services, I knew I simply had to undergo a facial too. Though the spa location was practically on the other side of the planet from where I live, it was pretty easy to find. 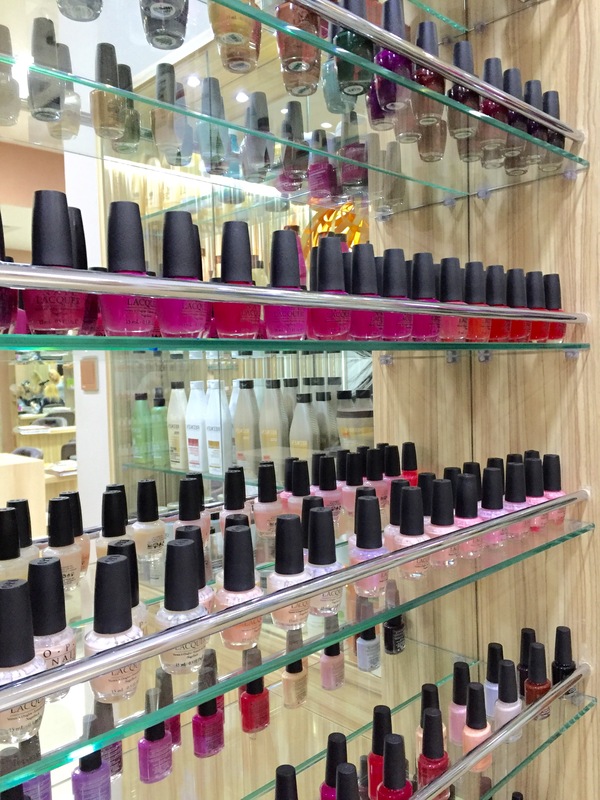 I was welcomed in and once I filled out my details, I had a chance to potter around and admire the products displayed, such as the nail polishes photographed below. Something about colours organised in a neat fashion gets me every time! After a few minutes, I was escorted to the back of the spa lounge in to a teeny tiny room where my facial would be done by a Facialist, named Oxana. Let me just tell you, that she did such a grand job and the facial was honestly one of the best ones I’ve ever had. Oxana did not only give me a facial, but also a head, shoulder and neck massage along with skin diagnosis and advice for how I can improve my skin routine. She began by asking questions about my current skin routine (which is ashamedly almost non-existent) and analysing the skin on my face, which is mainly dry and in dire need of moisturising. She then explained the methods she would be using to replenish my skin and began by applying a mask. Her fingers worked their way around my face like magic. After that, my face underwent the painful stage of extracting blackheads. Never the best part of a facial, but has to be done! Following that, she used a couple of electric methods, the first to zap out any remaining bacteria on my face and the second was to push the lotions lathered on my face deep within the skin to achieve maximum moisture. The head, shoulder and neck massage given to me whilst another mask was drying on my face was unbelievably relaxing. Oxana didn’t miss a spot and I felt rejuvenated once it came to an end. My only qualm would be that I would have liked some kind of background music playing to drain out the noise coming from behind the walls. The last step was to close all my pores with an ice cold glove pressed across my face, and being offered to drink a glass of water. The sensations my face went through were incredible, and when I touched my face after the facial was complete, it felt so soft and plump, as if I was touching Baby Z’s bum! All in all, the entire facial took around 90 minutes. 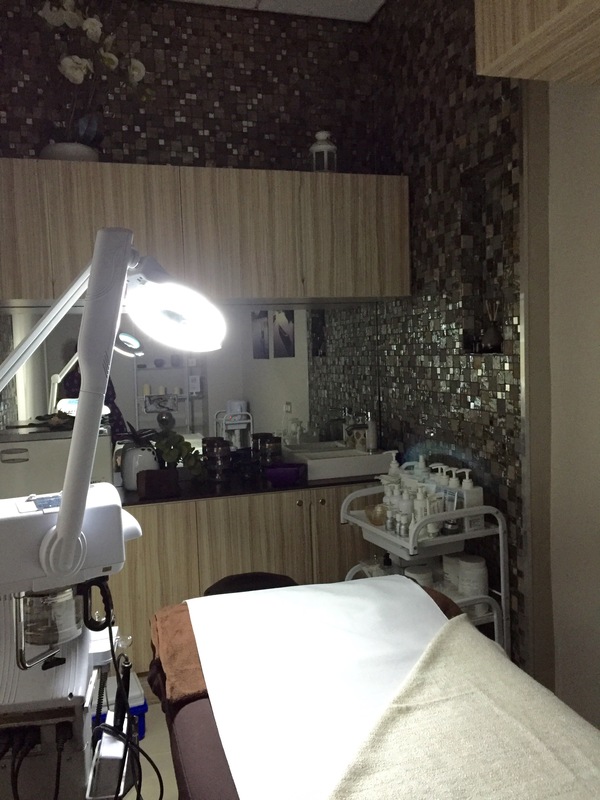 If it is not already obvious, I would highly recommend the facial to you because Oxana really does go above and beyond to give you the best experience. It was now time for a hair cut, and this time it was Yulia‘s turn to work her magic. She gave my hair a quick wash and did her thing. She asked me what I wanted and was very quick at getting it done. She blow dried my hair to perfection, and let’s just say I was swishing my hair back and forth for the rest of the evening (in the confines of my own home, of course). The Nimue Facial Cures are priced at AED 400 and a hair cut and blow dry ranges from AED 150 to AED 250, depending on the length of your hair. Though the facial is a pricey, from my experience, I would say it is worth it, especially for the dedication that Oxana shows. 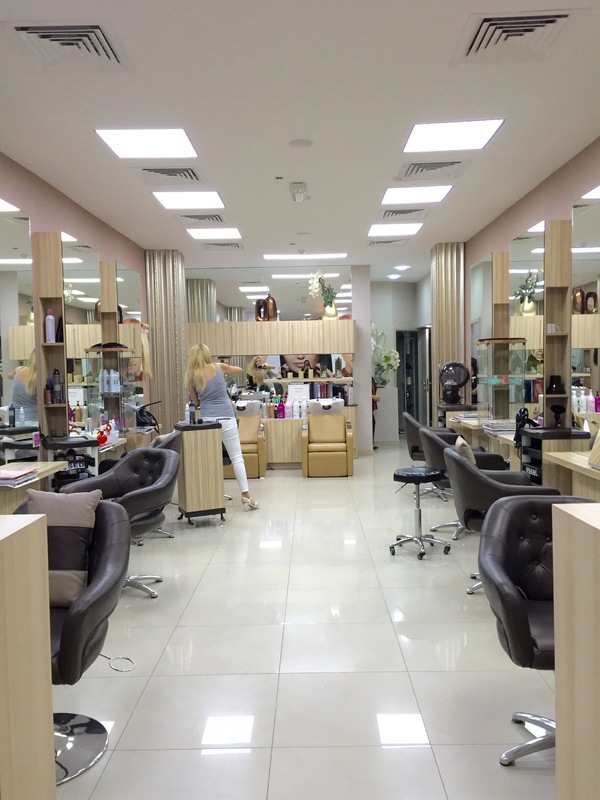 The hair cut is of a standard price range and Yulia definitely did a good job. 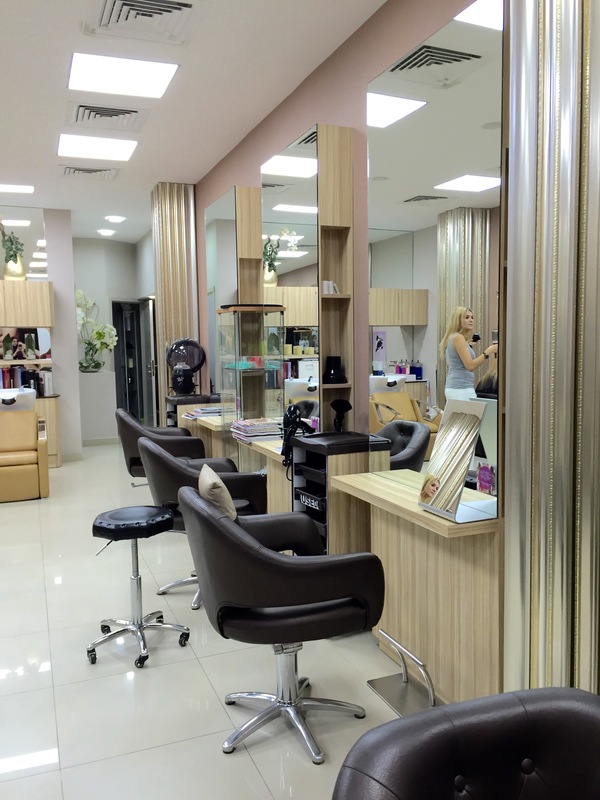 The Cure offers a whole wide range of services, from hair colouring to body massages, across both their branches, the other being in Dubai Media City. Over all, I had a great experience, and now I completely understand why the facial is worth raving about. Note: I was invited to try out the services at The Cure, however all views and opinions expressed above are honest and solely my own. 10 years in Dubai and still looking for a great place for facials!! Will certainly try out The Cure-thanks for sharing. You’re welcome, please do! And let me know how it was too! ?